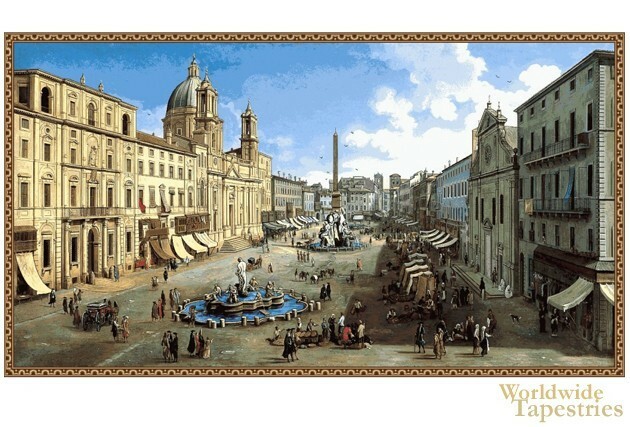 In Navona Square tapestry we see the historic view of the Piazza Navona in Rome. Here we see the fountain surrounded by the beautiful baroque Roman architecture which includes 5 fountains in total. Beginning as Stadium of Domitian in the 1st century AD, it became a public space since the 15th century. This cityscape tapestry is filled with detail and nuance of color. Navona Square tapestry is backed with a lining and a tunnel for easy hanging. Note: tapestry rods and tassels, where pictured, are not included in the price. Dimensions: W 12" x H 9"
Dimensions: W 48" x H 24"